Soon enough (I promise) I’ll give another super long blog post to recap all of the great workshops we’ve had over the last month, and talk about how awesome it has been to watch the group grow. I’m still flabbergasted to see our facebook group has 60 members. But in honor (or because of) our first anniversary, it’s time for us to begin to advertise the group’s call for submissions. Our goal is to share the work of the brilliant writing community in Pittsburgh by curating a new online literary magazine that also showcases the benefits of working in a community of writers. As result, we are aiming to publish about 50% material from within the group and 50% will be free game for all of you Pittsburgh-based writers out there. Tentatively we plan to host our first reading at The Inn (https://www.facebook.com/CollegeInnProject) in early December. Please include a cover sheet with your name, e-mail, phone number, title(s) of submission(s), and a brief bio-blurb. Text should be submitted as Microsoft Word documents via email to hourafterhappyhour@gmail.com. You will receive a confirmation of your submission within 3-5 days. We cannot offer any payment for our authors/artists at this time. We are aiming for a February 2014 release, and though we read submissions on a rolling basis, to be considered for the first issue please send us your work no later than January, 1st, 2014. 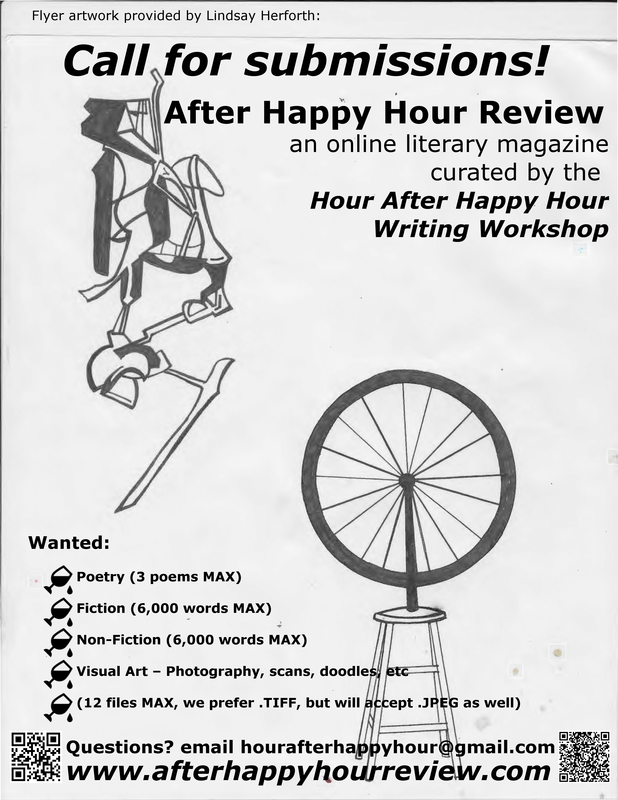 Email hourafterhappyhour@gmail.com with any questions regarding the After Happy Hour Review or the submissions process.